Got the Home Theater system connection blues? It's always a bit frustrating to newcomers and seasoned audio-video enthusiasts alike when you're faced with that array of input and output connectors. But it helps to understand which connectors to use and what kind of signals each carries. Banana Plugs: Use these only for speaker (high-level) connections instead of bare wire between your A/V receiver's speaker output terminals and your loudspeaker input connections. Convenient for quick connection or disconnection of speaker cables. No improvement in sound quality over bare wire or spades, but less likely to short circuit or corrode, especially if gold-plated, than bare cable. Virtually all 5-way binding posts on newer speakers and subwoofers accept either single or dual banana plugs, including all of Axiom's speakers. Many A/V receivers' speaker outputs also accept banana plugs if there is enough space. Note: Banana plugs won't work with older speakers' and receivers' plastic "push" connectors, which only accept bare wire. Balanced (XLR or Cannon) Connector: A secure 3-wire connector found on all professional and semi-pro sound equipment and on some upscale consumer A/V components (including Axiom subwoofers), enabling very long cable runs without hum pickup or frequency response losses. Must be used with matching balanced connectors on an A/V processor, preamp, or A/V receiver to benefit from its hum-free traits. Over long cable runs, sound quality will be better than that of conventional shielded RCA coaxial cables because increased cable capacitance in the latter may induce losses in frequency response. Binding Posts, 5-way: A type of speaker cable input and receiver/amplifier output connector that accepts bare speaker wire when you unscrew the top and push the wire through the hole in the post, spade connectors, pins, and single or double banana plugs. Binding posts are only used for High-Level (also called Speaker-Level) connections for amplified audio signals from an A/V receiver's speaker outputs to the speakers. Stereo systems with amplifiers or preamps lacking a subwoofer output would also use the amplifier's high-level outputs and the subwoofers hi-level inputs. Signals may be routed through the subwoofer and then to the main speakers, or separately from the amplifier to the main speakers with a second set to the subwoofer. The receiver/processor's internal bass management cannot be used with high-level speaker/subwoofer hookups. Coaxial Cable: Standard 2-conductor shielded cable comprised of an outer woven metal shield (the ground connection) covered with plastic/nylon insulation and further insulated from the inner "hot" or positive wire. Used universally with RCA male plugs on each end for routing "low-level" (also called line-level) left and right analog audio signals from CD players, DVD players, cassette decks, set-top boxes, and satellite receivers to A/V receivers and amplifiers. The RCA plugs are often color-coded red for Right channel and white (or black) for Left. Also used for composite-video connection (color-coded yellow) and digital coaxial audio connection as well as analog SACD or DVD-Audio analog multichannel outputs and inputs. Coaxial cable is also used between the A/V receiver's subwoofer output jack (color-coded purple) and the subwoofer line-in connection. Component Video: The most common type of connector used for both Standard-quality video and HD video, it uses three coaxial RCA cables and plugs color-coded red, green and blue (the three cables may be wrapped together for convenience) to carry analog Standard- or High-Definition video between a set-top satellite or cable-TV box to the A/V receiver and TV display or projector. Most new A/V receivers include component-video inputs and outputs that let you switch between different video sources. Note: Component video cables do NOT carry audio signals. You must connect separate audio cables (either analog or digital) to carry the sound portion of DVD and cable/satellite TV signals. Component video cables keep the color elements of a video signal separate from each other and should always be used between matching video devices that have component video inputs and outputs. Composite Video: A single video connector that combines all the color, brightness, and sync signals into one cable (hence "composite") using a single RCA connector. Often color-coded yellow, it is the most common type of analog video connection between older VCRs and TVs (except for RF connectors). Use composite video only if your TV, VCR or DVD player lacks S-video or component-video connectors. Composite video will not carry High Def or progressive-scan video signals. D-Sub: A type of multipin connector so-named because of its rough "D" shape, originally used in computer and data applications and now used in several variants for audio/video purposes. See VGA and RGB. DVD-Audio: A high-resolution multichannel audio format that uses up to eight shielded RCA cables (sometimes bundled together) to carry analog surround-sound output from a DVD player capable of DVD-Audio playback. Many new A/V receivers have a six- or eight-channel Multichannel analog input set that accepts the multichannel analog audio output of DVD-Audio or SACD players. This connection may also carry decoded Dolby Digital 5.1 or dts signals but most DVD soundtracks, whether Dolby Digital or dts, are normally conveyed with a single digital audio cable, either optically (Toslink) or coaxially, to the digital audio input of the A/V receiver. Don't confuse DVD-Audio with the usual Dolby Digital 5.1-channel or dts surround soundtrack of DVDs. Most inexpensive (less than $150) DVD players will not play high-resolution DVD-Audio or SACD formats. "Universal" DVD players will play these formats as well as conventional DVDs and CDs. DVI (Digital Visual Interface): A large computer-like 18-pin connector that carries digital video signals, including High Definition signals, between a set-top HD cable or satellite box or DVD player and an HDTV set. DVI digital video signals are protected by HDCP (High-bandwidth Digital Content Protection) protocol, which prevents you from copying high-quality digital video. DVI is gradually being replaced by the smaller HDMI connector (see below). DVI/HDMI adaptors are available, and many HDTV displays and projectors have both connectors. Although a DVI or HDMI connection eliminates several digital-to-analog and A/D conversions, it does not visibly improve image quality over correct component-video connections and may introduce incompatibilities in the HDCP anti-copy protocol (see HDMI). Component-video can, with proper signal levels, give exactly the same quality as HDMI or DVI as long as the native resolution of the set is sent to it. FireWire (see IEEE 1394; i.Link): First common in the computer world, this 4-or 6-pin connector is a link that carries compressed digital MPEG-2 video and digital audio for recording on a hard-disk or D-VHS digital videotape recorder. Found on some digital TV displays and set-top boxes, FireWire also carries an anti-copy code and can serve as a 2-way link between various devices in a network. Not found on most A/V receivers and DVD players. Fiber-Optic (also called Toslink): A thin plastic or glass-fibre cable that carries digital signals in an optical format via pulses of light. Uses a small, square plastic male connector on each end. Most recent A/V receivers have both Toslink optical digital as well as coaxial digital inputs. Many DVD players have one or the other (or both). No difference in sound quality between optical or coaxial digital connections, but optical links are not susceptible to hum or interference. HDMI (High-Definition Multimedia Interface): Much smaller and more convenient than DVI, HDMI is a USB-like digital video connector that carries the same digital video signals as DVI but with the added advantage of conveying a Dolby Digital surround sound bitstream. Copy protected with HDCP so you can't pirate high-quality digital video, it's compatible with DVI through DVI/HDMI adaptors. No image superiority of one over the other. HDMI is an evolving standard and many incompatibilities in the digital "handshake" of the HDCP protection code still exist between HDMI-connected components, especially when routed through an A/V receiver or A/V processor. HDMI is not a robust system yet. Component-video can, with proper signal levels, give exactly the same quality as HDMI or DVI as long as the native resolution of the set is sent to it. HDTV (High-Definition TV): Not a connector but part of the new digital TV standard that features increased horizontal and vertical resolution, a choice of progressive or interlaced scanning, and a widescreen aspect ratio of 16:9 (the ratio of a screen image's width to its height) that conforms to the widescreen visual format of modern movies (older analog TVs have a squarish-looking 4:3 aspect ratio). The most common HD formats are either 720p (720 progressively scanned lines) or 1080i (1080 interlaced scanned lines) or some variation of these. DVDs, although digital, are Standard Definition (480i), which may be displayed as 480p. IEEE 1394 (see FireWire, above): also called i.Link. Interconnects: Any set of cables or connectors that link A/V equipment of all kinds, however, most commonly the term designates low-level RCA audio and video connectors rather than speaker cables. Jack: Any female receptacle of an audio or video connector into which the plug, or male connector, is inserted. All connectors have male and female components, RCA plugs and jacks historically being the most common on consumer-grade audio/video equipment. Sometimes the terms jacks and plugs are used interchangeably. Mini-jack, mini-plug: A miniature connector, in mono and stereo versions, commonly found on portable audio equipment, including iPods, for headphone and line-out connections. Rare on A/V gear except for "trigger" outputs and inputs that are used to remotely activate electric screens, separate power amplifiers and subwoofers in elaborate custom home theaters and installations. Multichannel Analog Input (see DVD-Audio, above). If your DVD player has the capability of playing back high-res DVD-Audio or SACDs, use this six-cable RCA connector set to connect to the analog multichannel input of the A/V receiver. Phono Jack: Always an RCA connection on A/V receivers or preamplifiers for the output from a turntable's moving-magnet (MM) or moving-coil (MC) phono cartridge. Still available on up-market receivers and preamps. Don't confuse this with "Phone Plug" (or Jack), which is a larger and sturdier ¼-inch diameter connector used on consumer A/V equipment for headphones. RCA Connector: By far the most common small audio or video connector, with a pin (male) plug and female jack. Uses 2-conductor shielded coaxial cable. RGB: In its connector form, it routes discrete red, blue and green color signals to HD displays. Its variant, RGB+H/V, also carries the horizontal and vertical sync signals on separate connectors. Sometimes found on separate high-end video processors, scalers and projectors. More often used with a VGA connector (D-Sub-15) between computers and monitors. RGB is not inherently superior to component-video connections. SACD (Super Audio Compact Disc; see DVD-Audio, above): a high-resolution digital multichannel audio standard developed by Sony/Philips that uses DSD (Direct Stream Digital) audio encoding. You'll need a bundled, shielded 6-cable RCA connector set to play back SACD to the A/V receiver as well as an SACD-compatible DVD player. SDTV: Standard-definition digital TV, defined as a 480i signal (480 interlaced scan lines) presented 30 times per second. SPDIF (Sony Philips Digital Interface): A format for exchanging digital audio signals between consumer audio gear. The actual connectors are either Toslink optical or coaxial digital (see above). Sometimes confusingly used to refer to fiber-optic (Toslink) connectors. Speaker Cable: Available in various gauges or wire thickness, designated by "AWG" followed by a number e.g., AWG12 is 12-gauge speaker cable. The lower the number, the thicker the cable and the less resistance there is to the passage of amplified audio signals (AWG12 is thick; AWG18 is fairly thin). All speaker cable is 99.9% oxygen-free copper and is normally supplied in 2-conductor unshielded form. 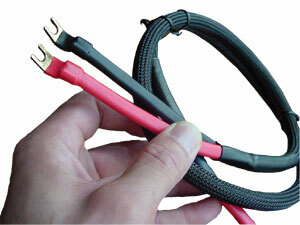 You'll need one 2-conductor cable for each speaker in your home theater system, except the subwoofer. A 5.1-channel system will require five separate speaker cables plus a single coaxial cable for the subwoofer (see Coaxial, above); a 7.1-channel system, seven cables plus a single coaxial sub cable. To keep electrical resistance (measured in ohms) to insignificant levels, choose the speaker cable gauge by the length of the cable run from the receiver/amplifier to the speaker. For runs up to 20 feet, 14-gauge is fine. Use 12-gauge speaker wire for long runs up to 60 feet or to err on the side of conservatism. Speaker cables do NOT need to be the same length from the receiver/amplifier to each speaker. Good generic speaker cable can be purchased in bulk. Speaker cable does not impart musical qualities to the movement of electrons, despite the fanciful claims of reviewers with hyperactive imaginations. All copper cables of sufficiently thick gauge sound identical. S-video: A small multi-pin connector cable that carries the chrominance (color) and luminance (brightness) video information separately. Not capable of carrying HD video signals but superior to composite video connections. Use this connector for better image quality if your TV, A/V receiver and VCR has S-video inputs and outputs. Toslink (see fiber-optic, above): A plastic fibre optical cable for conducting digital audio signals in optical form, as pulses of light. VGA (see D-sub, above): Originally found on PCs but now found on some HDTV monitors and tuners, it uses a 15-pin D-shaped connector to carry video and sync information. If your HDTV has a VGA (D-sub) input, you can connect your laptop or PC directly to the HDTV for display purposes. XLR (see Balanced Connector, above). This list comprises the most common types of audio and video connections you are likely to encounter in setting up your speakers, A/V receiver, subwoofer, TV or HDTV, projector, DVD player, set-top cable box/satellite receiver, VCR, DVR and gaming console. For more detailed discussion of some hook-up problems, see the Axiom Archives.